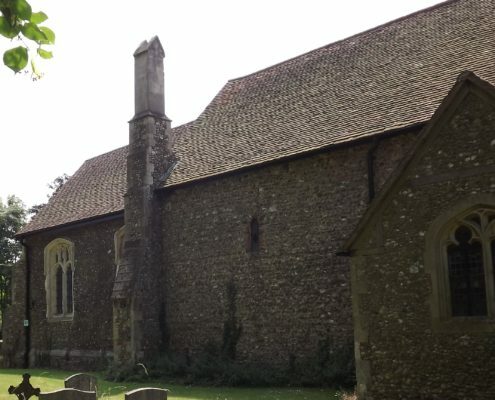 St Andrews and All Saints Church was formally in the parish of Willingale Spain, named after Hervey D’Espania, located within the Dunmow Hundred, with two manorial properties, Spains Hall, and Minsons (demolished in order to build the airfield). 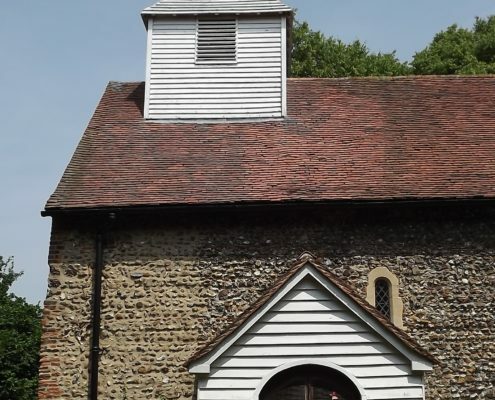 The Church sits next door to the larger Parish Church, St Christopher’s, separated from each other by the Essex Way with views over the Roding valley. The church is built in the early English style of Henry II on the site of an old wooden church. 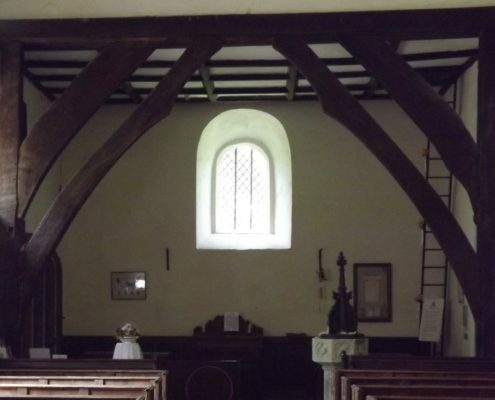 However whilst the shell appears Saxon, it is impossible to date, it may be that the nave is one of the oldest in the county and remains largely unaltered. The dedication of St Andrews and All Saints is unusual and it is thought that there were two altars. Two small drains thought to be a piscina remains in the nave as well as the piscina drains in the chancel. Piscinas are used to empty and wash the holy vessels during communion. In 1120 St Andrews was given to Priory of St Lawrence, Blackmore by William de Hispania for the prayers of the souls of his wife, his father, himself and his family. It does make you wonder if there may have been a big family secret that William felt he needed to appease God for? Later it became the property of Clerkenwell monastery until the dissolution of Henry VIII, when it went to the crown. Its condition slowly deteriorated until in the 1950’s the church was derelict with an unstable roof and it was taken on by the Friends of Friendless Churches. (See leaflet here). In 1985 it was declared redundant and in 1992 it was taken on by the Redundant Churches Fund, now the Churches Conservation Trust , who have carried out more major repairs so that St Andrews is thoughtfully conserved. Thanks to these and other efforts this church remains a wonderful historical monument and peaceful and spiritually enriching place of reflection and worship and open for visitors 365 days. A place where people can bring flowers to mark the passing of major events in their lives. At Christmas there is a memory tree and throughout the year displays mark the passing of the seasons. Whilst the churchyard is under the care of St Christopher’s Church, to the right hand side of the south porch entrance of St Andrews is an unusual stone coffin lid which is probably dated to early 12th century. In 1989 a trench was being dug to improve drainage at an angle between the porch and the southwest corner when it was discovered and lifted to its new position. However, this was not its first discovery. It was found in 1865 about two feet from the surface with no coffin and subsequently reburied allowing someone else the excitement of finding it again. The church is constructed of flint rubble with Roman tiles and brick. There are two noticeable patterns in the flint work. 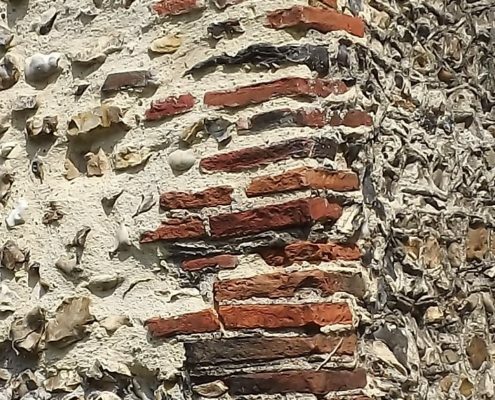 Looking at the north façade, where you can see the small 12th century windows leaving a large expanse of flint work on view, the appearance of the flint work appears to be built in rows. Compared to the 15th century chancel with its larger windows and the appearance of rows is less obvious. 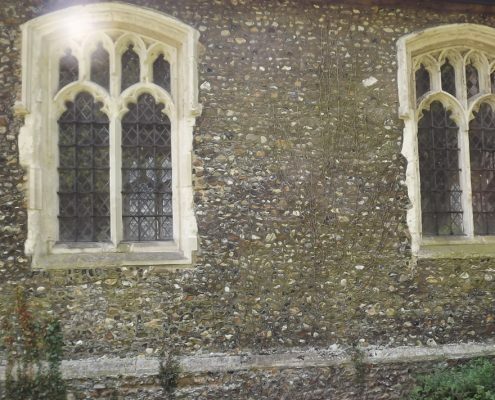 The corners of the building, called the quoins, were built using roman tiles and bricks and roman tiles and bricks can also be seen on the nave doorway and the vestry doorway. Three centuries of window design. On the south facing wall only one 12th century window remains, there is a 13th century window which looks like an elongated 12th century window at the chancel end of the nave( the far right hand side of the picture) and in-between a 14th century window was inserted, much wider with fine stone work, called tracings. Under this window you can see the ancient repair of the flint rubble which looks quite random in comparison to older flint work. The church has a 15th century bell turret which is weather boarded. There are two medieval bells which are unable to be rung currently. One is uninscribed whilst the other is inscribed ‘ Johannes Cristi Care Dignare Pro Nobis Orare’ thought to be of late 14th century by John Langhorne. Internally the bell turret is at the west end of the nave standing on two 15th century posts with two pairs of curved beams. On the south side of the church where the chancel joins the nave this ventilation hole can be seen. 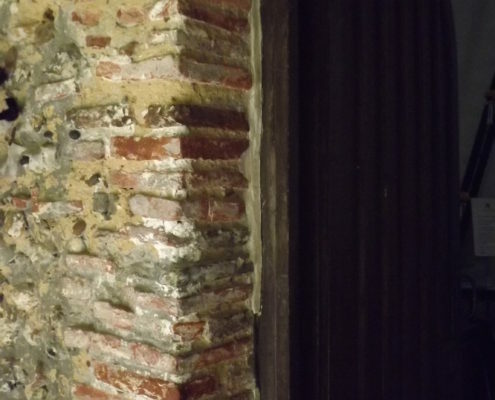 When the trench was dug along its perimeter in 1989 whilst no foundations were seen in the chancel the south east buttress had been underpinned with 18th-19th century brick, the notes (unascribed) suggest this was underpinning of the ‘Brocket vault’. 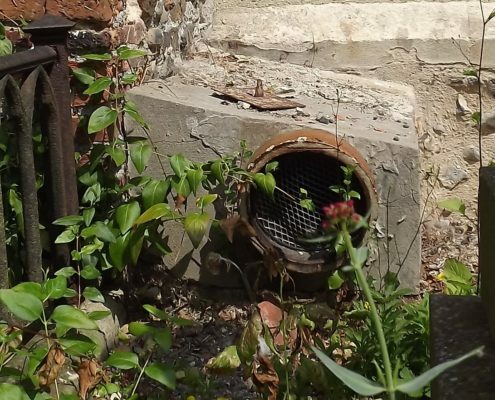 Is this a ventilation hole for the crypt? However, an elderly resident informed me that this was nonsense as this was the delivery point for the coke for the new heating system installed in 1909. On the north side of the church you can see the chimney stack that was installed for this heating. On entering the church you can see the font. Placement of fonts prominently as you enter was to remind visitors of the importance of baptism. 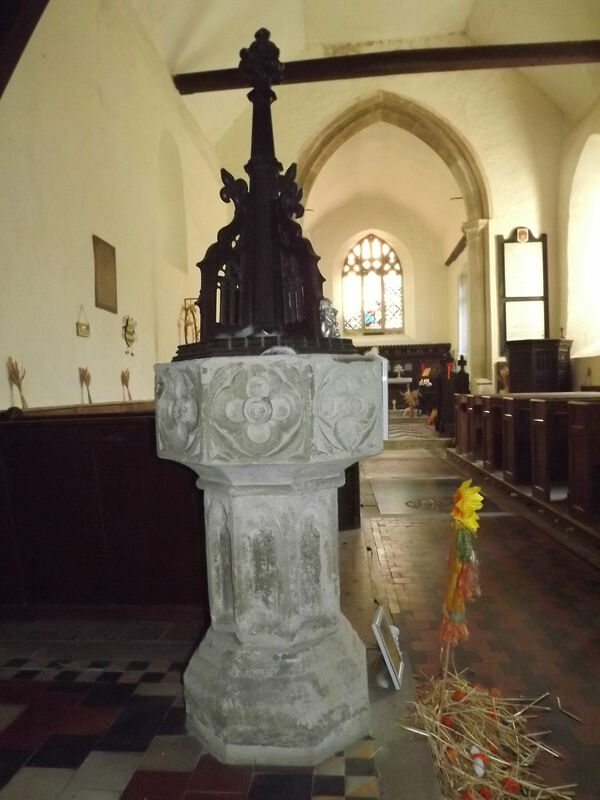 St Andrews stone font is a monopod with an octagonal bowl decorated on three faces with recessed head in round loobed quatrefoil and on the north side the head appears to be encicled in rays of glory. It is thought to be late 14th century or early 15th century and may have been given by Clement Spice, a self made man, not born into gentry but became a gentry lawyer through a judicious marriage and accumulation of wealth.He was Lord of the manor at Willingale Spain until 1420. The vestry door was considered to be one of the oldest specimens in the county with a fine example of ancient iron work. In 1860 Hadfiled was exuberant in his praise suggesting that the door was ‘well worthy of study’ and ‘pleasing in both design and execution’ he goes on to complain that the ‘inhabitants of Willingale Spain are not possessed of much love for this remarkable relic of antiquity’. He suggests that the latest date that can be assigned to the door is the time of William I, 1066-1127. The Nave measures 40 1/2 foot by 19 foot and looking towards the north side there are the two 12th century windows and the ancient doorway. One of the 12th century windows has coloured glass, put in as part of the 1891 restoration using the glass found under the chancel. The south wall has the three centuries of windows to admire and also the possible altar with the piscina drains under the 14th century window. Also on the south wall is a royal coat of arms for King George II and a list of incumbents. Starting with the vicar Hugo de Ebtrostonwe around 1329 until the last rector Rev. Colnett who left in 1928. Spot the difference with these two photos. The pulpit was given by Mrs Brocket of Spains Hall to commemorate Queen Victoria’s reign in 1901. Mrs Brocket died in 1907. In 1911 it was moved and the large box pew removed and a heater was put where the pulpit was. The chancel measures 24foot by 15foot and alongside the chancel arch was re built in 15th century on the site of a smaller chancel. 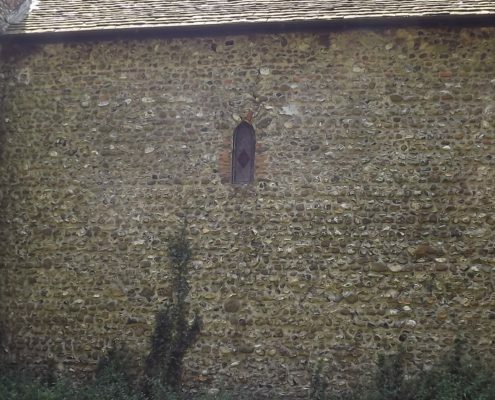 The North and south walls have 15th century windows and on the north wall is a recess which may have been a former doorway possibly to a sacristy. The south wall priest door has 15th century strap hinges also on the south wall the piscina drains can be seen in a recess. Of note in the chancel are the scratchings or graffiti. On the west jamb of the cedilla, a seat in the wall just after the altar rail, there are 15th century scratchings of cross bows and an archbishop. These were added to an American, ‘MD’ added his mark. It is understood that MD loaded the bombs onto the marauders when they were stationed in Willingale. There is a further 15th century scratching of a bishop on the chancel arch near the priests stall on the left hand side as you look to the west window. In 1891-92 the reverend Payne oversaw renovations to the church, including the vestry, the south porch and the work on the reredos and tiled floor. Rev Payne in the General Meeting of the Essex Archaeological Society in 1898 talks about the pleasure of unearthing a window and the stone altar. It is thought that the Stone altar was buried during reformation of Edward VI c 1550 when Edward decreed that all stone altars should be destroyed. The Stone measures 6 foot 6 inches by 3 foot 3 inches by 6 inches and weighs about three quarters of a ton. The stone has five incised crosses symbolising the five wounds of Christ. Behind the altar is a reredos that Rev Payne commissioned. 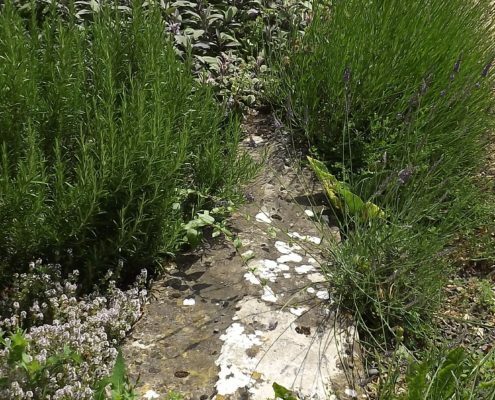 It includes a medieval beam from the Elizabethan rectory that no longer exists. The window on the east probably dates from that period and a plaque notes that like the font cover it is in memory of Rev Parker. Records mention the ‘Bewsey’ memorial but this disappeared a long time ago. In the chancel are two stone slabs in memory of Isaac and Joseph Kello, who died of scarlet fever in 1614 aged 9 years and 13 years. These were sons of Bartholomew Kello rector 1607-1614, His wife was Esther Inglis was a notable Calligrapher and her husband her business partner with connections in many royal courts and possibly a spy for James I of Scotland. As part of the education pack a story is avaible here LINK. On the south wall of the chancel is a memorial to Richard Colnett son of the last rector who was wounded and missing in Palestine in 1918. In the floor of the nave is a slab in memorial to John Markham, died in 1757, late of Paternoster Row. John Markham was an apothecary of note and a governor of the Bethlem Institution where established an infirmary in 1741 and a second in 1753.He was buried in St Andrews as he was married to a Brocket. On the wall behind the pulpit is a plaque to this manorial family. On the south wall is a memorial to Charles Pix Meryon his wife Mary and their son Stanes Brocket Meryon. On the north wall is a plaque to the men of the parish who fell in the Great War naming George Cogdale, George Henry Perry, Samuel Perry and Ernest Radford. There are two modern permanent displays in the church with information on the American airbase during the Second World War and some articles and photographs of the church. The Essex archaeological society NS VIII p 375. General Meeting of the Essex Archaeological Society 11th June 1898 pages 181-182. 1957/8 the Essex countryside extract o friends leaflet. Royal Commission on Historical Monuments England, 1921. An Inventory of the Historical Monuments of Central and South West Essex, vol II, page 262. 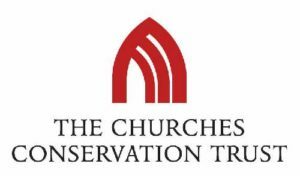 The Churches Conservation Trust, (2000) The church of St Andrew and All Saints, London.